Words are toys, and Mark Forsythe of The Inky Fool knows how to play. 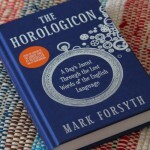 Just got The Horologicon to review. Happyhappy, because I so enjoyed his previous book The Etymologicon. The Horologicon is organised around our wakeful times and it begins, as it should, with dawn. 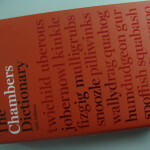 I’ve only just read the first chapter and have already added a few useful words to my lexicon. Like “hypnopompic” – those “strange half-dreamful, half-conscious delusions and illusions”. And “day-peep”, a word eighteenth century farmers used for “dawn”. There’s also “dayening” and “early bright”. A bit of a horror in the modern English ear, but a joyously precise word, is “uhtceare”. It’s not a word for dawn, but for pre-dawn worries. “Uht” is the word for “the restless hour before dawn”. “Ceare”, which Forsythe tells us is pronounced key-are-a, was an Old English word for care and sorrow, “emotions that have an annoying habit of striking during the uht”. This is etymology dressed for a party while it wittily inserts asides on history and social development. I’m not sure I retained that much new information from The Etymologicon, except the memory of amazement and laughter. I’m making a point of remembering “uhtceare” though – so that I can sigh dramatically when the sky is “day-raw” and console myself that at least there is a name for my pre-dawn affliction.